Atal Bihari Vajpayee, the father figure of Bharatiya Janata Party (BJP) used to call him ‘Purkayastha ji’, all the time. “I met him for the first time in 1952-53 when Atal Bihari Vajpayee, who later went on to become the Prime Minister of our country, came to Silchar to meet some followers of the Jana Sangh, as he was the general secretary of this wing in those days,” reminisces, ex-Union Minister Kabindra Purkayastha. Speaking to Northeast Now Thursday, as his eyes are set on the television sets, Kabindra Purkayastha, narrated one incident after another, of his days with A B Vajpayee. “In 1980 on April 6, Atal ji, called a meeting of all Jana Sangh members in Delhi and I was called to attend it. Later, in the evening of that day, he called me personally and said verbally to take charge of Assam, as Jana Sangh was officially rechristened as Bharatiya Janata Party. Surprised he was no doubt, for till late at night before the oath taking ceremony next day, Kabindra Purkayastha was not aware of getting any ministry. But, next morning when he woke up at 7 am, a call came and along with it three invitation letters informing him that he needs to get ready for taking oath and these three invitations are passes for him to bring three other family members along. Between Atal Bihari Vajpayee’s tenure as leader of the opposition from 1993 to 1996, once Uma Bharati, the then BJP’s Mahila Morcha President wanted to do a rally in Karimganj district of Assam. She approached him and was sent off saying if Purkayastha ji, says so, I would think about going. 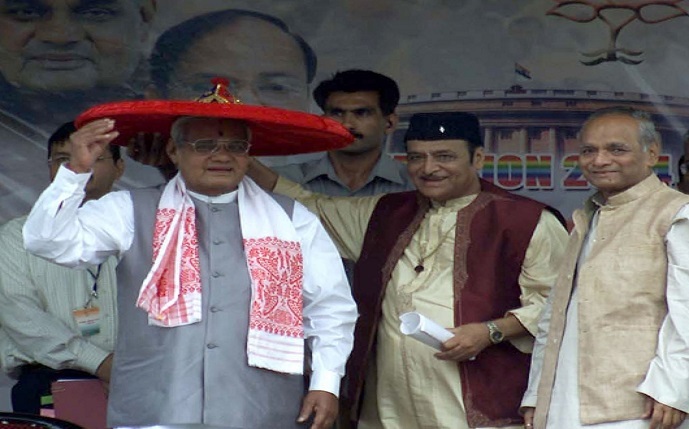 File photo of Atal Bihari Vajpayee, the then Prime Minister of India being felicitated with the Assamese traditional “Gamosa” and “Japi” by Dr Bhupen Hazarika, BJP candidate from Guwahati LS Constituency during the first election campaigning meeting of BJP in Guwahati,on 6-04-04. UB Photos. 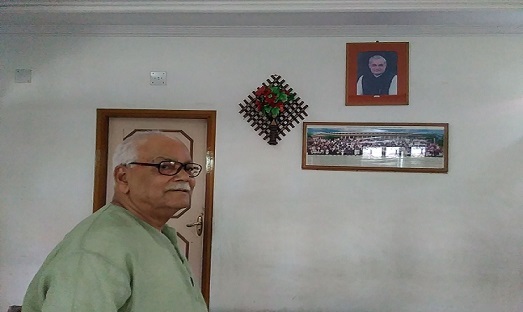 Before winding up his conversation with Northeast Now, Kabindra Purkayastha didn’t stop from saying the nature of his own father figure, Atal Bihari Vajpayee, from whom Purkayastha ji learnt the nuances of his political career. “Once when I went to meet him, he didn’t say anything but told me to join him for a ride. I thought he would take me to some parts of Delhi, but when we reached New Delhi airport, I boarded the flight and again asked him as to where we were going. He didn’t say anything but upon reaching Kurukshetra which is nearby in Haryana, we went to address a rally. I was surprised to see my cut outs too out there and he never said me anything all along. He is that type of a person one whom I can never forget in my lifetime,” Kabindra Purkayastha added. Indeed it is hard to forget with whom Kabindra Purkayastha spent the most part of his political career and left the job to join politics, the doyen of Indian politics above all party lines, 94 year old Atal Bihari Vajpayee breathed his last at 5:05 PM on August 16, 2018.